Kalaloch Lodge at Olympic National Park is one of those lodges you can’t believe you get to stay at. Located on the Pacific coast of Washington this lodge truly blew our minds. 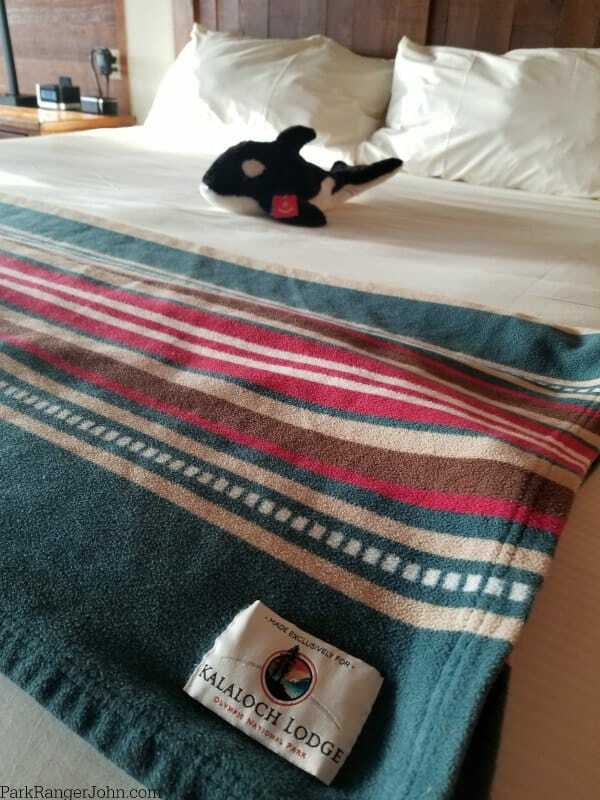 We stayed in the Kalaloch Suite and honestly it was one of the most amazing National Park Lodge rooms we have stayed in. From the moment we walked into our room at Kalaloch Lodge we honestly did not want to leave. The view is beyond epic! We are already talking about planning a return trip during the winter to see the storms blow in from the Pacific Ocean. This is a lodge you could easily spend a week relaxing. Reading an amazing book, watching the weather pass by, eating delicious food and soaking up no wi-fi or strong cell phone signal. You can use the spotting scope to look for Bald Eagles and whale watching. You might even spot sea otters and gray whales in the Olympic Coast National Marine Sanctuary. 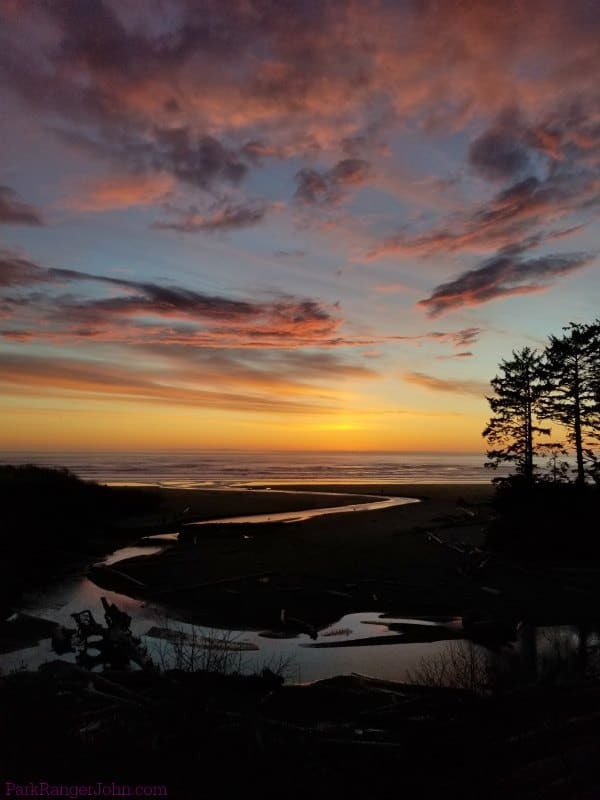 The Kalaloch Lodge is the perfect place to stay while exploring the Olympic Peninsula. Super close to Ruby Beach and the Hoh Rain forest. The ocean views are just beyond words! The Kalaloch Suite had a king size bed, small refrigerator, microwave, coffee maker, armoire, table with a spotting scope, soaking tub and an epic view of the Pacific Ocean. The bed has a custom made Pendleton Blanket that is beyond soft and I thought about buying to take home with me. We found the bed to be super plush and comfy. It is one of those hotel beds you really do not want to leave in the morning. 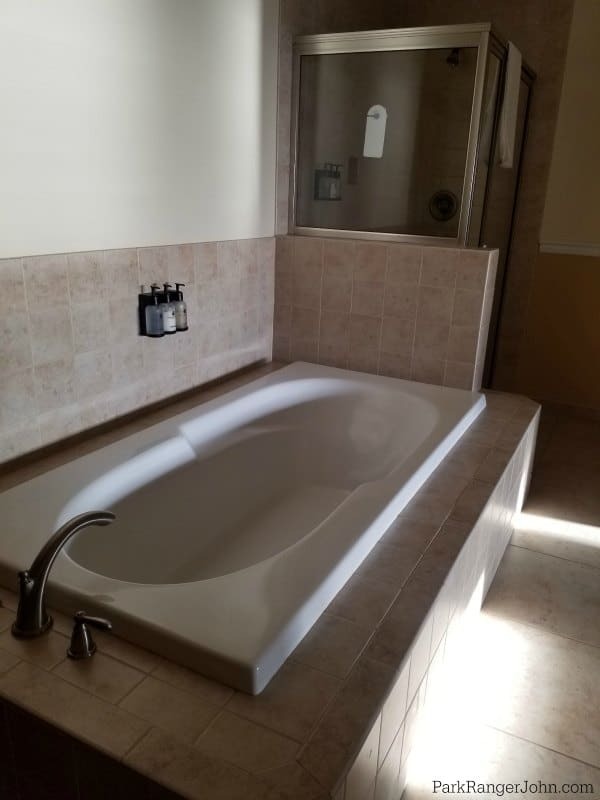 The soaking tub is pretty large and perfect for relaxing in. There is also a stand-up shower. The sitting area has a comfortable couch with views of the water. 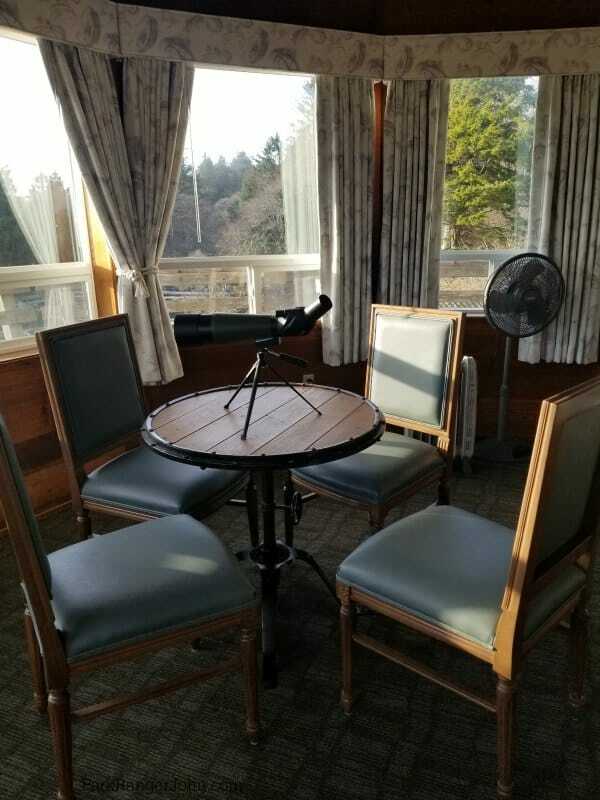 There is also a small table with chairs and a spotting scope for looking at whales when they migrate past the lodge. There is a small deck wrapping around the front of the suite that is perfect for watching the sunset and stars at night. We wrapped up in the Pendleton blanket and spent a long time watching for falling stars and looking at constellations. The sunset was amazing. Can you imagine watching the huge storms roll in off the Pacific Ocean while staying warm in your room? This definitely has to happen next winter. 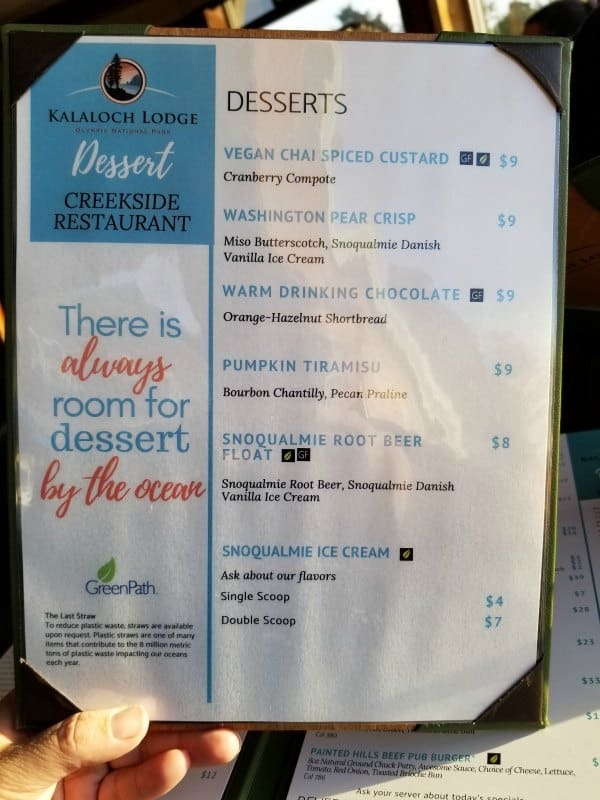 The Creekside Restaurant at Kalaloch Lodge offers not only epic views of the water but delicious food. From breakfast to dinner you can expect to enjoy a great meal with an epic view. 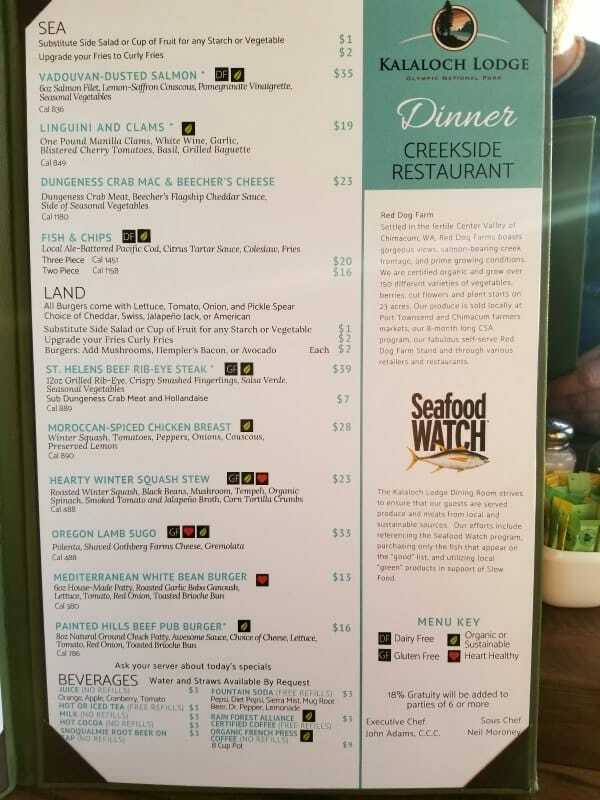 All food served at Creekside Restaurant is free of trans fats. All meat, seafood, eggs, dairy, and produce that is served at the restaurant are free of hormones and steroids. The restaurant prides itself on serving delicious and healthy food options to guests. During the growing season, the restaurant serves 60% of its food that is sourced within 150 miles from the lodge. Even the wine selection is all amazing Washington State Wines. 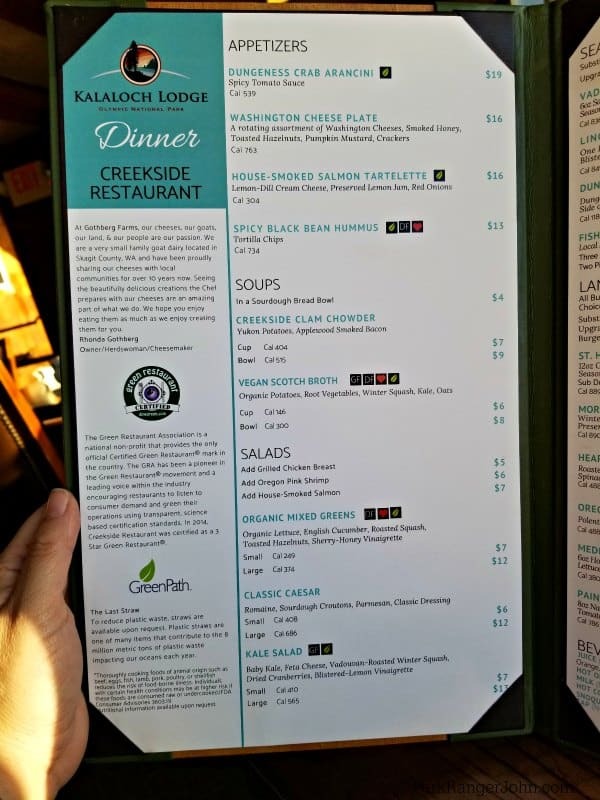 We really enjoyed both dinner and breakfast at the Creekside Restaurant. We enjoyed amazing service with great waitresses who had us smiling during our entire meal. The food was served fresh and hot. 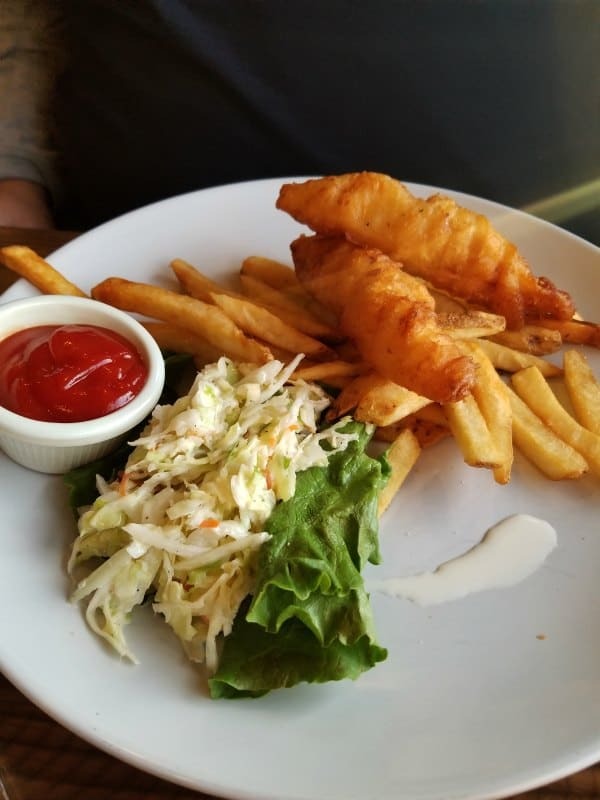 The fish and chips were nicely portioned and perfectly paired with a local IPA. My wife enjoyed a veggie burger that was huge and she could barely finish it. The french fries were crispy and tasted amazing. We were so full that we skipped dessert even though it looked delicious. Breakfast was super relaxed and the food was great. 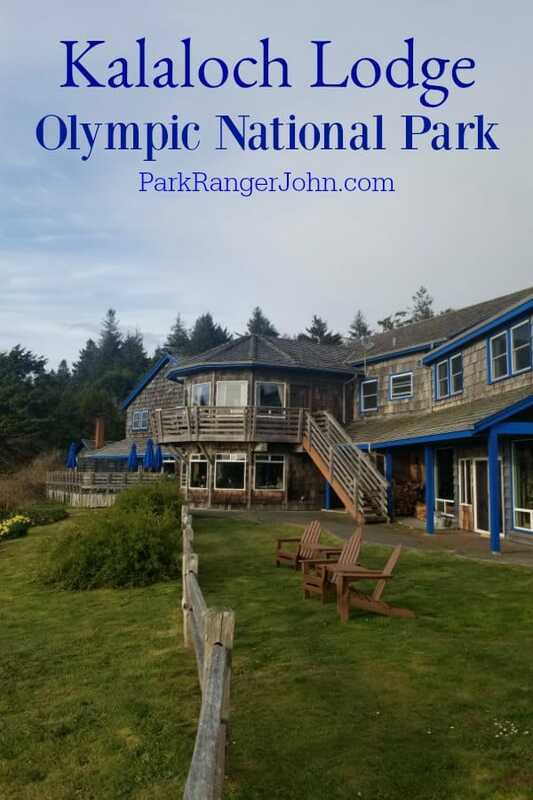 There is a small gift shop in the main lodge that has Olympic National Park souvenirs and field guide that are perfect for exploring the park. Across the street a few feet there is a small market with groceries, ice, firewood. 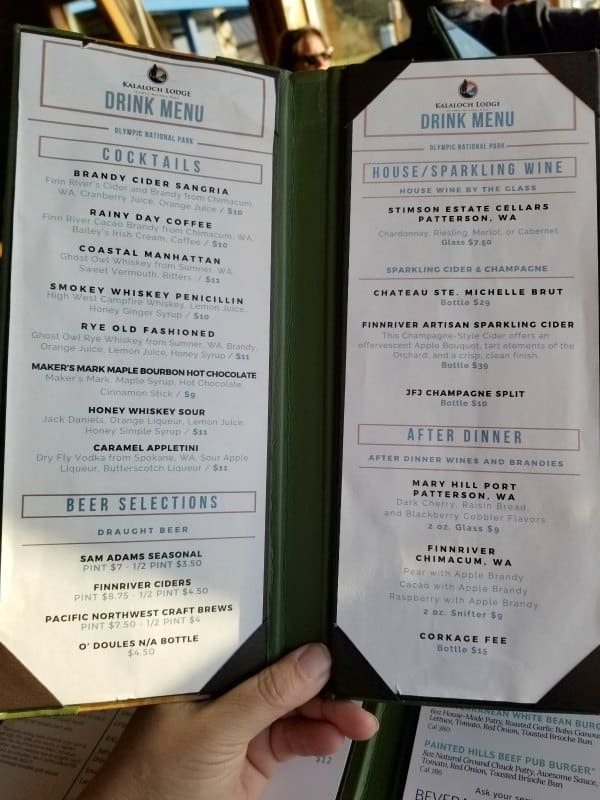 They have a great selection of Washington wines and beers. Reservations: Make sure you book through the hotel directly! There are a few websites that show up on search engines that charge pretty large fees to make a call to the hotel and book the room for you. 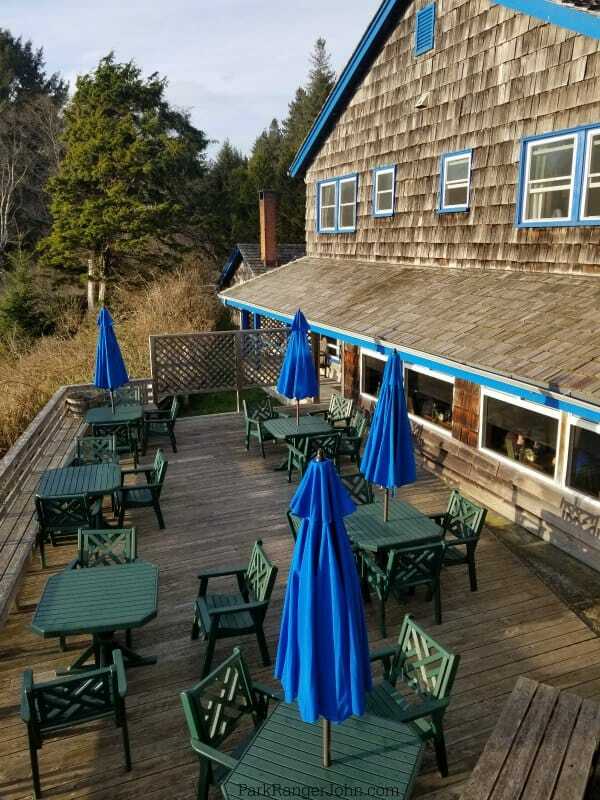 Make sure you make your reservation as soon as you know the dates you wish to visit Kalaloch Lodge or any of the Olympic National Park lodges. I would definitely try to get your reservation in at least four months ahead of time during busy summer months. An optional $3.00 donation to the Washington National Park Fund will be added to each room night at Kalaloch Lodge and the Group Campground. Deposit Policy: A deposit equal to the first-night room rate plus tax will be charged at the time of booking. Cancellations: A $25 fee will be charged for all cancellations. Cancellations made within 72 hours prior to the day of your arrival will result in a forfeit of your deposit. 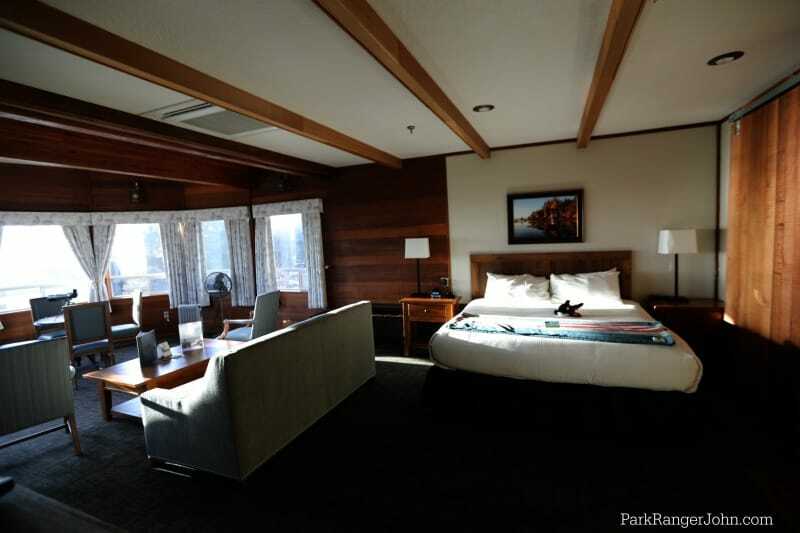 Pets – Pets are allowed in any of the Kalaloch Lodge Cabins but are not allowed in the main lodge or Seacrest House. There is a $25 per pet fee, with a limit of two pets per cabin. 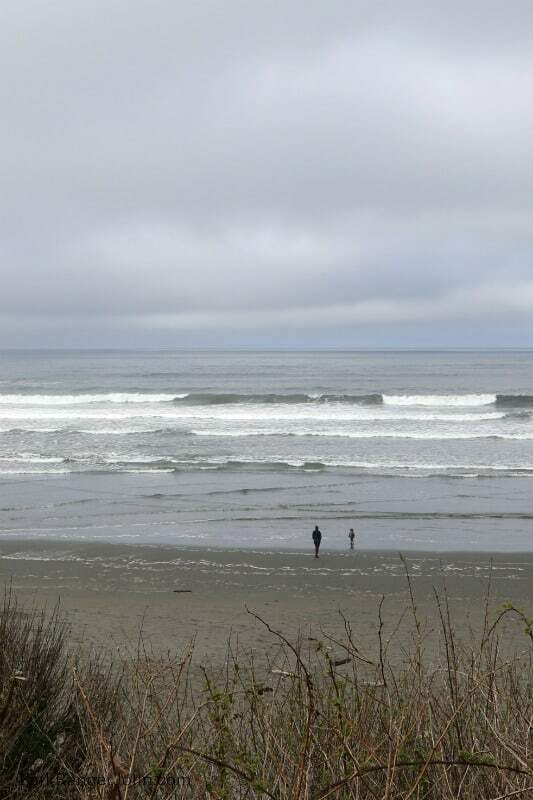 Kalaloch Lodge is run by Delaware North an authorized concessionaire of the National Park Service. Check out all of our Olympic National Park posts for additional places to stay and things not to miss in the park!